I wish there were a Nobel Prize in Music. 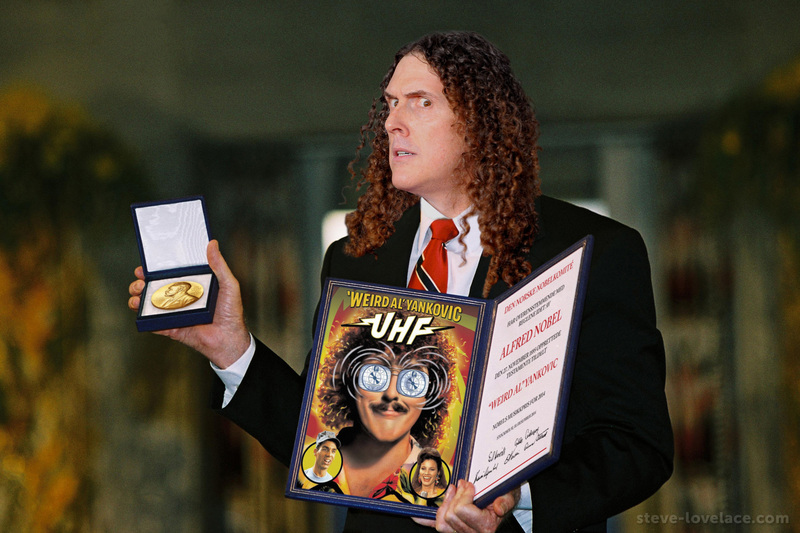 I would nominate Weird Al Yankovic. He is without a doubt one of the greatest musicians of our time. Since the 1970s, he has been parodying hit artists with a lyrical genius that no one else can match. As a comedy artist, Weird Al often gets overlooked. But in terms of record sales and staying power, he’s up there with Michael Jackson, The Beatles and Madonna. Weird Al had a big influence on my own musical upbringing. I remember hearing his “Even Worse” album as a kid. I loved the song “La Bamba” at the time, so I fell in love with his parody, “Lasagna”. Though it’s no longer my favorite song of his, it opened the door to my own Weird Al Yankovic fandom. Soon I was watching UHF on repeat. Then, when Weird Al parodied Nirvana with his song “Smells Like Nirvana”, I learned about 90s Grunge. Soon I was listening to the original songs, and a whole world of music appreciation opened up to me. By the late 1990s, Weird Al was parodying the hit songs that I already knew, but I still appreciated his work nonetheless. As I’ve gotten older, my music tastes have become somewhat set in stone. Now when I hear a new Weird Al parody, I often have to go track down the original song just to understand the parody. For example, I had never heard of Iggy Azalea until I heard Al’s new song, “Handy”. On the other hand, I had heard way too much of Lorde, who gets a lot of play on the alternative stations even though she’s more of a pop star. Just the other night, I heard Lorde’s “Royals” playing for the umpteenth million time. But instead of being annoyed, I was amused. All I could hear Weird Al’s bizarre parody lyrics about sandwich wraps at Illuminati conspiracies. That to me is the real magic behind Weird Al. He makes crappy songs good and good songs even better.